Before electronic ignition, vehicles required an R-Terminal, which bypassed the ignition resistor for easier starting. Today’s electronic ignitions do not use a ballast resistor, therefore they do not require an “R” terminal. When updating an existing starter to a racing starter which does not have an “R” terminal, simply do not connect this wire. 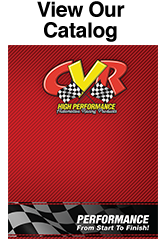 Note: CVR offers a 5323R for Chevy engines with factory points ignition that requires a relay terminal. Another option is that a remote solenoid can be added that has a built-in relay terminal. Note: The CVR Protorque starter is designed to cross the flywheel between .400” and .500”. This is quite sufficient for this type of unit with proper shimming. Caution: Over tightening of battery terminal may result in misalignment of solenoid contact causing intermittent starter failure. If this occurs, remove the gold tin cover held in place by three (3) hex head bolts and realign the copper contact so plunger assembly makes full contact across both contacts. Shimming Procedure: Unlike Ford and Chrysler which have a fixed starter drive gear to flywheel clearance, GM starters have an Adjustable Clearance. Important: Most GM pad-mounted starters prematurely fail as a result of improper shimming, regardless of whether the old starter had shims or not, you must inspect the clearance of the new unit as it may or may not require shimming. You must understand the need for proper starter to flywheel clearance. This “clearance” is critical to avoid damage to Flywheel, Starter Drive and Battery. Mounting pad tolerances and hole locations vary from block to block, this moves the starter drive gear away from the flywheel varying distances. The mounting pad on the engine block dimensions vary. This also moves the starter drive gear away from the flywheel varying distances. Insert a screwdriver behind the starter drive. Move starter drive assembly out toward flywheel so that starter pinion and ring gear teeth mesh. Center the pinion tooth. Check clearance (looking for .025” – .060”). A convenient plug gauge is a common paper clip, which typically measures approximately .035”. Important – Check at least 3 ring gear locations 120o apart for proper clearance. Shim as required at minimum clearance location. After measuring clearance, push starter drive back into original position. To increase clearance: Use entire shim across both holes. .015” shim increases clearanceapproximately .0075”. This moves the starter down and out, away from the flywheel (use no more than 6 shims).